MiLP mill-flops Premium hair pack 200g. 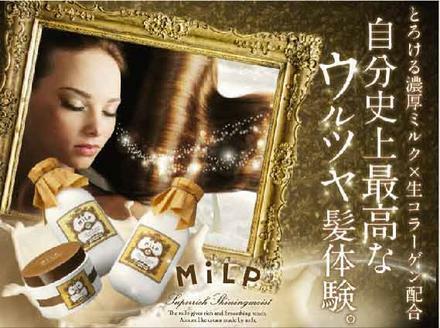 Luxury combination professional Moisturizing Milk intensive repair hair ached new skin care ingredient in the collagen raw pole and Yogurt extract fragrance of "Vanilla Rose"
I pick up an (Muscat 1 grain to 2 grains minutes) appropriate amount and let you be familiar with the whole hair in several places. Wash with foam bubble carefully easily enough, to massage the scalp in the stomach of the finger. As it is, to adsorb the dirt of the scalp more tightly, that the pack still on 1-2 minutes plenty of foam, moisture ingredient will penetrate the hair. I pick up an (Muscat 1 grain to 2 grains minutes) appropriate amount, stretched the whole hair around the place to be worried about the damage and let you be familiar well. When you pack at 2-3 minutes as it is, moisture ingredient will penetrate the hair more. ※ I rinse firmly treatment so as not to remain on the hair and scalp. Or shampoo, to take the moisture lightly after treatment, I pick up an appropriate amount of hair pack, stretched the whole hair from the point of a brush, let soften well. Rinse well, if you'd familiar with hair enough. ※ moisture repair component will penetrate the hair more to 2-3 minutes pack. ※ It is more effective if you use it in conjunction with mill-flop Series. and we recommend that you cancel use, and is talked about with skin Fu department specialists You. ● Please wash it away with water or tepid water, immediately if it gets into eyes. ● Please do not be put back into the container again the contents taken out once. ● hot or cold places, extremely, please do not keep it in place within the reach of small children. Tags : MiLP mill-flops Premium hair pack 200g.